The NRC recently issued a report that documents how we reached the conclusion the cracks discovered in the Davis-Besse shield building do not compromise its ability to perform its safety function. We’ve previously written about the NRC’s exhaustive efforts to ensure the cracks found in the shield building around the Davis-Besse nuclear power plant’s containment structure are not compromising current safety. This report clearly demonstrates the questioning attitude and the safety focus of our inspectors as they monitored FirstEnergy’s activities to analyze the shield building cracks and to conduct painstaking reviews of the company’s operability analysis. Upon the discovery of the cracks, we formed a special technical review team consisting of NRC Region III inspectors and headquarters specialists. This team was tasked with ensuring a thorough and rigorous review, and they rose to the challenge. 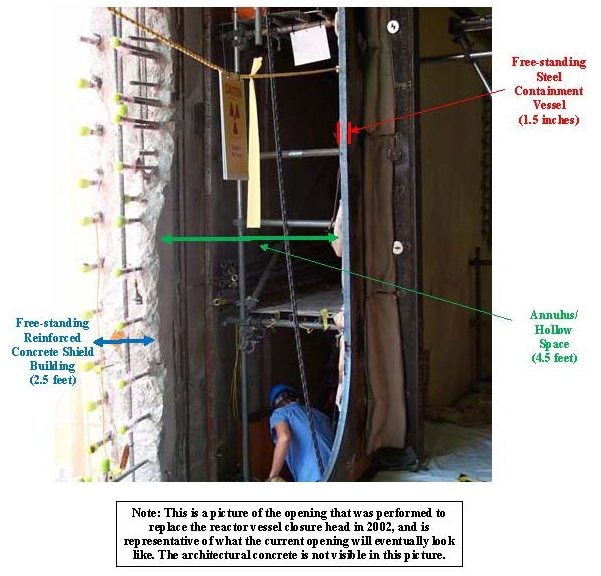 First, the NRC inspectors monitored FirstEnergy’s testing of the shield building cracks; they verified the quality of the tests; and made sure that the extent of the testing was sufficient to evaluate the extent of the cracking in the structure. As a result of the questions raised by our team, the company performed additional tests so there was enough data to reach a valid conclusion. Then, the NRC inspectors spent a number of weeks reviewing and questioning FirstEnergy’s analysis of shield building safety. They continued to challenge the company’s calculations, engineering assumptions and conclusions. Some members of the NRC’s team made multiple trips to Davis-Besse to make sure their questions and concerns were effectively addressed in face-to-face meetings with the site’s engineers and consultants. Two revisions of FirstEnergy’s operability evaluation were needed before our technical team was satisfied that it was thorough enough to show that the shield building was safe for continued operation. Our work continues with the review of FirstEnergy’s root cause report and proposed long-term corrective actions. We plan to finish the review, issue the inspection report and schedule a public meeting during the summer. NRC’s Report on the Davis-Besse Shield is explaining very well on this page, I like it while reading, thanks!